We hear a lot of talk about "portion distortion" but what exactly does that term mean? As our nation has become industrialized, the cost of food has dramatically declined. As food cost declined, portions gradually became larger, especially for meals eaten away from home - restaurants that provide more "bang for your buck" have more sales. Over the years our plates, mugs and bowls have also increased in size, which has effectively masked the increase in portions we are served (and that we serve ourselves). That is the heart of portion distortion, an increase in portions that has gone unnoticed by our eyes and stomachs. 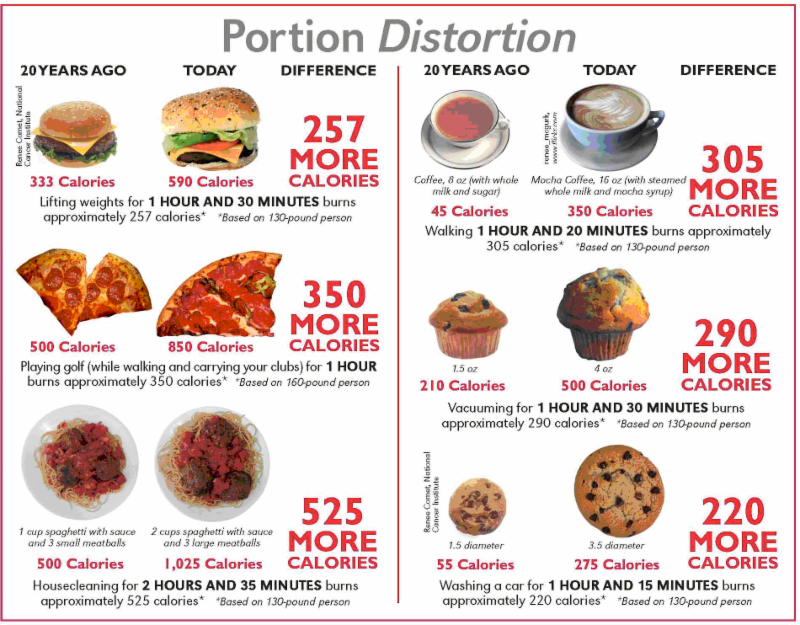 Unfortunately, portion distortion has not gone unnoticed by our bodies, as we now consume more calories from these larger portions. Our increased caloric intake has resulted in a steady increase in the average body size of both children and adults in the United States. When eating out, either split your meal with a friend or family member, or take half of the food you are served and immediately put it into a to go container. Most restaurants serve portions that are easily 2-3 times what we should eat. At home take the extra time to measure out portions as stated on the Nutrition Facts Panel of the food you plan to eat. As time passes your eyes will become accustomed to what a proper portion looks like and you won't have to measure, but you will need to remain aware of what you put on your plate.